When you’re motivated, you’re motivated toward an end. Money is never more than a means to an end. It gets you things, whether it’s a motorcycle, and new sword, or a title at court. It buys a lot of intangibles too, like respectability, clean records, new connections, and occasionally happiness. Even the act of saving money isn’t keeping money for its own sake, but having it buy security for a time when you need it. Investing it can increase the amount, but that just buys further security and the knowledge that it isn’t inert.That extra cash you’re getting means that it’ll buy more of whatever it is that you want. I already said it isn’t a motivation worth having. What matters, what’s interesting about money, is what characters do with it once they have it. Do they spend it on themselves, on their family, making new friends, or give it away? How do they think about it? Does it frighten them or intrigue them? In D&D the answer seems simple, since most characters spend the lion’s share of their wealth on impressive items that improve their magical powers and ability to smack things, but all those really do for a character who’s ostensibly motivated by money is give them the means to get more money. For those increasing in power to settle ancient debts or blood oaths, money buys them the means to fulfill their obligations. What a character spends their money on shows what they really care about. What they’re willing to do to get that money shows how much they care about the thing they need to buy. These are the spaces to make interesting choices involving money, and they reveal a character’s real motivation. There are definitely characters who actually care about money for the sake of itself. They want to have it, and enjoy the touch and scent of filthy lucre. Parker, from the tv show Leverage is one of these characters. 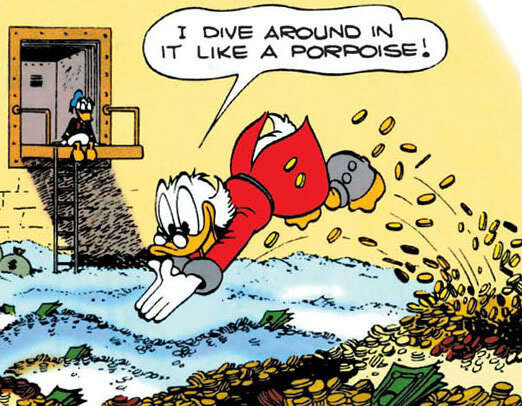 So is Scrooge McDuck. And they’re both reasonably interesting characters with all kinds of attachments. It’s tempting to argue on this basis that money for the sake of money can be a motivation worth having. But both characters also enjoy being stinking rich. They spend a lot to secure their wealth, invest in infrastructure, and make tradeoffs and choices about their wealth. 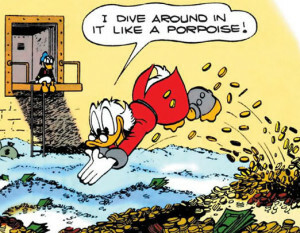 Scrooge McDuck keeps all his money in cash and in a giant bin with a dollar sign on it so he can swim in it. Downside is that everyone knows where his cash is, so he has to keep upgrading security to keep those pesky Beagle Boys out. Money is useful as a motivation only so long as the buck doesn’t stop there. Sure, it’s easy for a PC to make a life as a sociopathic mercenary travelling the road with a group of other sociopathic killers, but where’s the fun? The things that make us people, that make us interesting, are the things we look to that are outside of ourselves. The things we cherish, the things we yearn for, and the things we spend our time and resources on, not the resources themselves. It’d be a pretty neat idea, though. A room full of gold, gems, and soulgems. You could drop other people into it, I suppose. Or slow fall. Is slow fall still a thing in Skyrim?